JACOBEAN AND . . .
Last week I told you about Cromwell and 17th century happenings in England. This week I want to tell you about the interiors and furnishings before, during and after Cromwell. I found a marvelous resource with useful information that I think you will enjoy as much as I did. During the Jacobean, Cromwellian and Carolean portions of the Stuart period, that is to say, between 1603 and 1688, the articles of furniture in common use were chairs, stools, forms, settles or settees, love-seats, day-beds, bedsteads, mirrors, tables, footstools, chests, cupboards of sundry sorts, cabinets, buffets and dressers or sideboards. The contour and style of the furniture of the Jacobean period, as of every other period for that matter, more or less faithfully reflected the social, intellectual and religious temperament and manners of the times. One can scarcely imagine Dean Hook seated in a dainty Sheraton chair, while one of Cromwell’s lieutenants in buff and bandolier occupying an Adam settee would be as absurd an anachronism as Julius Caesar driving abroad in a hansom or a motor car. The furniture was stout and staunch, even to clumsiness and severe in form and line even though bedizened with a superfluity of ornament. It matched the coarse manners, abrupt morals, and vigorous theology of the day with all their grotesquerie, terrible earnestness and redundancy of polemics, brimstone anathema and persecution. Contour and style were both thoroughly in accord with the genius of the people. 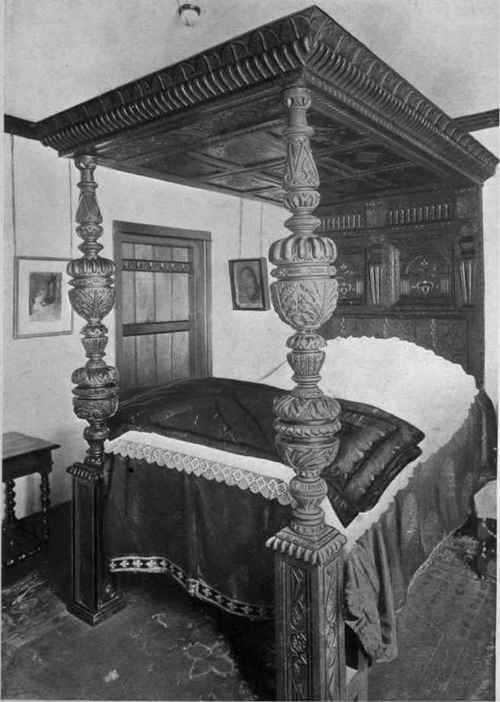 PLATE I. JACOBEAN BEDSTEAD, MORETON, SALOP By Courtesy of ” House & Garden”. In the cabinet work of the later Cromwellian era the contour of carcases remained much the same except that cupboards, while still squatty, were apt to be of greater length and, with the growing strength of Dutch influence, “bun” or ball feet on chests (Fig. 6) or cupboards became more common. Chests of drawers or chests with combinations of drawers and cupboards came more into fashion. During the Stuart period there is such a diversity of contour resulting from the modification of native English traditions by an increasingly large influx of Continental influences that it is doubly essential to grasp the typical forms as exemplified in the Key at the beginning of the book and the line drawings in the text. In the truly Jacobean or early Stuart period we find a predominance of straight lines, simplicity of structure and craftsmanship of downright British vigour and energy. All the different sorts of cupboards and dressers were of no great height and even the bedsteads with their ponderous testers carved and panelled, supported on heavy posts, were low – much lower than one would imagine from looking at pictures of them. The squat proportions of the furniture were due to and quite consistent with the usually low-ceiled rooms. Development in the form of chairs and the marked increase in their number during the three divisions of the Stuart period afford one of the most interesting and instructive features of that fruitful mobiliary epoch. Hardly anything so faithfully and fully reflects the manners and customs of an age and the changes taking place therein as furniture, and of all articles of furniture the chair is by far the most sensitive to new and foreign influences of changing styles – much more so than cabinet work. It reflected not only the flux of fashion but accurately registered political and social changes as well. In the early Jacobean period, chairs were comparatively scarce, stools and forms being in more general use. These early chairs usually had arms and were seats of great dignity. Both chairs and settles had high seats and usually heavy stretchers between the legs. Chair seats were square or almost so and chair-backs were high and perpendicular or so nearly perpendicular that the rake was scarcely perceptible. 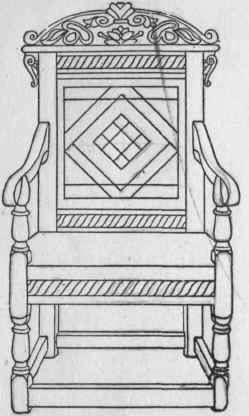 The triangular seated and heavily turned chairs, whose pattern had been brought to England, probably by the Normans, were met with but were survivals in type. The characteristic chair of this date was the wainscot or panelled back chair. These chairs probably owed their inspiration in the first instance to choir stalls. 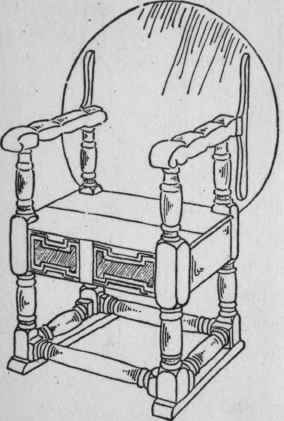 In Elizabethan chairs of this pattern, the top rail bearing the cresting is within the uprights of the back. In Jacobean chairs the top rail caps the uprights and is part of the cresting. These wainscot chairs (Pic. 2, b) continued to be made long after the Restoration. Seats were made high with the express expectation of using either the stretcher or a footstool. There were also occasionally to be found X-shaped chairs pretty well covered with upholstery, but these occurred in the earliest Jacobean days and were so scarce that we can afford to pass them without further mention. Fig. 2. a, Jacobean Oak “Monks Seat” or Table Chair, c. 1660; b, Jacobean Oak Panel-back or Wainscot Chair, c. 1630. Carved, turned and inlaid. By Courtesy of Mr. R. W. Lehhe, Philadelphia. Slightly before the Commonwealth we find the Yorkshire and Derbyshire type of chair with open backs (Fig. 3, a). The uprights ended in carved finials and there were usually two or three carved and hooped crosspieces and these were often further ornamented by acorn pendants. Sometimes instead of the hooped crosspieces, there were several horizontal bars, the spaces between which were filled in with arcades of slender spindles and carved rounded arches. Fig.3. a, Jacobean Oak Yorkshire Chair, c. 1650. Height of back, 3 feet 7 inches; height of seat, 17 inches; breadth of seat, 18 inches; depth of seat, 16 inches. b, Late Jacobean Walnut Chair, c. 1685, formerly belonging to Robert Proud, now in the collection of Pennsylvania Historical Society. Showing Flemish and Baroque influences in high caned back, scroll carving and ornate arched stretcher between the two Flemish scrolled front legs. Height of back, 52 inches; height of seat, 18 3/4 inches; seat in front, 17 inches; seat in back, 14 inches; depth of seat, 15 inches. 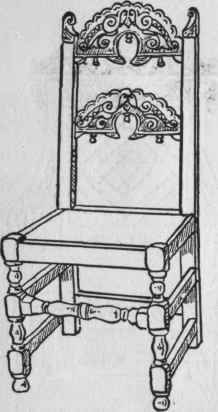 At the time of the Commonwealth chairs were made in much greater numbers than previously, as the democratic principles, then rampant, permitted master and servant alike to use the same kind of seat, whereas, formerly, the use of a chair implied certain dignity and position and the baser sort sat on stools. From this period date the low-backed chairs with turned legs, stretchers and uprights, the upper part of the back and the seat being padded and upholstered (Key I, 2) with leather or some sad-coloured stout goods. The backs had more rake than previously. At the Restoration, and even before that date, when popular taste was undergoing a revulsion against the spirit of repression and dulness that had so long been uppermost, a fondness for carving, though in altered form, again came to the fore. Open backs appeared in greater number with either caning or vertical balusters or slats. 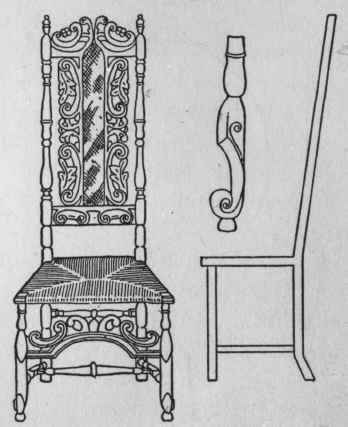 Top and bottom rails of many chair-backs showed a slight concave curve, more calculated to the sitter’s comfort, while not a few arms were either curved longitudinally or bowed laterally. Others, longitudinally shaped, flared outwards from the posts. The knobbed turning of legs and stretchers, that had been popular in the Cromwellian period, retained considerable vogue for some time after the Restoration and was employed concurrently with the new style of carving. About 1665 spiral turned legs came into much favour and were used for tables and other articles of furniture as well as for chairs (Fig. 7). This detail of style is apparently attributable to Portuguese influence and probably due to an East Indian source. Up to the Restoration all the better chairs had been made of oak but walnut now became generally available and lent itself much more readily than oak to delicate carving and turning. Cane-backed chairs appeared at first without cresting, the uprights ending in carved finials. The top and bottom rails of the back were often decorated with a lightly incised pattern of zigzags or roundels. Afterwards cresting was added, usually of acanthus and roses, the latter the royal emblem, from the prominent use of which in the decoration, this particular type of chair gained the name of “Restoration Chair.” Stretchers and uprights as well as legs were spirally turned, while Flemish scrolls and elaborate carving in backs and cresting came more and more into vogue. The caning at first had large meshes which, however, decreased in size in succeeding years. The next step in chair development was the addition of an elaborately carved, scrolled and usually hooped stretcher between the front legs. Very soon the Flemish scrolled front legs appeared and when these were set obliquely to the seat the approach to the cabriole form at once became evident. In the middle and latter part of Carolean times chairs and sofas with seats and high, square backs, upholstered with gay imported fabrics or some of the handsome textures that were already coming from English looms (Key II, 8) came into fashion. These also had the Flemish legs and highly ornate hooped stretchers. The last type of Stuart chair to which we must pay special attention is the high and almost perpendicular cane-backed creation of the end of the Carolean epoch, reflecting in every line strong Flemish and Dutch influences (Fig. 3, b.) These chairs showed Flemish legs, scrolled ornament of pronounced Baroque character and caned or baluster backs. This section is from the book “The Practical Book Of Period Furniture“, by Harold Donaldson Eberlein And Abbot McClure. Also available from Amazon: The Practical Book Of Period Furniture. Holy cats, Gail! So much information. And beautiful worded I might add:-) Nice job. I do love the ornamental nature of the time period, but the low testers over the bedstead would make me a bit claustrophobic. They were uncomfortable. I have sat in them when shopping antiques. They and other similar chairs were prevalent in the Victorian era, except there was lots of ornamentation on pretty much everything. They had little choice in those cold castles, built like fortresses. Imagine, and they didn’t even have electric blankets, only hot water in bags. But happiness prevailed, less is more kind of thing. Right? Yuk! Great and informative blog as always. Thank you. Thanks for stopping by Charl.